bela cokolada za dekoracija ili preliv. Matime prvo jajca so secer, vo gusta smesa,go dodavame i maslo,mleko,brasno,1 vanilin secer i pecivo.Mesame ubavo smesata i namastuvame so maslo tava br:30 i 2/3 od testo isturame vo tava. A vo edna tretina od testo mesame kakao i vo potenok mlaz pravime krugovi vrz zolto testo kako na slikata na nekoi mesta sipuvame povece da izgleda kako kafeavi topki pri secenje.narosuvame vrz torta 1 vrecica vanilin secer i peceme vo zagreana pecka od pred toa na 200C.Koga ja stavame tortata se namalete ja temperatura na 180C..peceme 20 minuti. 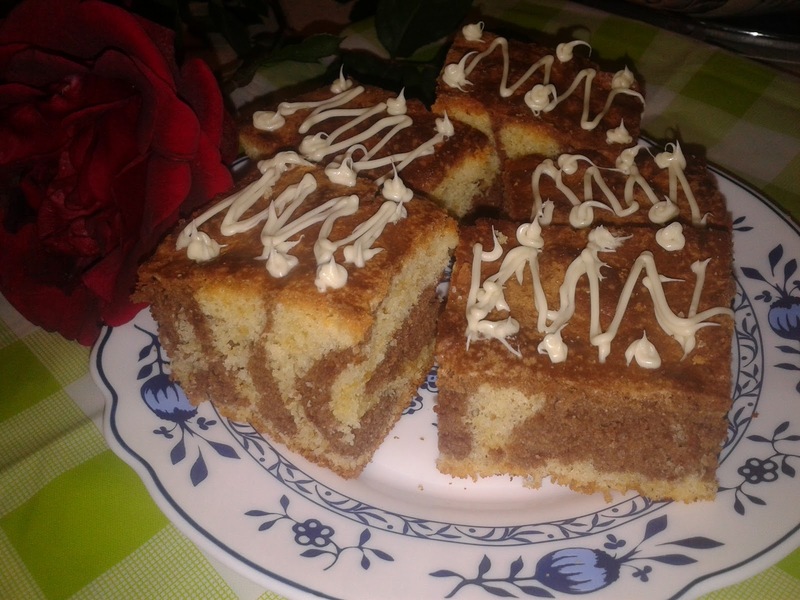 Za kraj dekorirajte so bela cokolada,izleguva mnogu torta vkusen sekojdneven desert so proizvodi od sekoj dnevna kujna. white chocolate for decoration or overflow. Whisk eggs are first sugar in the slurry, then add oil, milk, flour, vanilla sugar and 1 burst of baking powder.Stir mixture well and spreads the oil pan, salt flour NO: 30 and 2/3 of dough discharge into the pan. 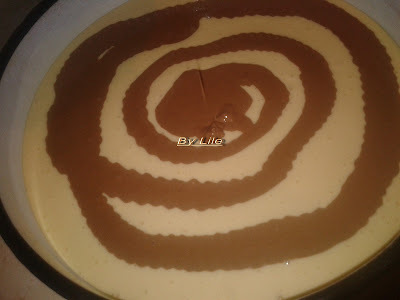 In one third of the dough mix and cocoa in a thin stream pouring batter say circles of yellow on the test, as some places pictures.And pour more it looks like a brown ball. Before baking cakes with salt cake vanilla sugar and bake in a preheated oven at 200C. When you put the cake.Reduce temperature to 180C and bake for 20 min. 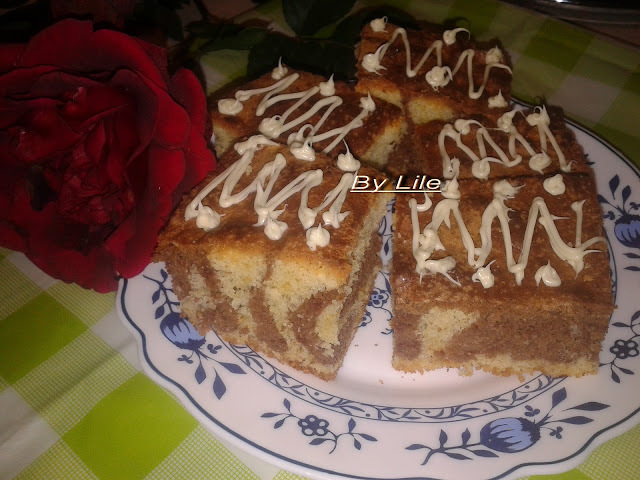 I finished the cake at the end decorate with white chocolate and cake bass is there a lot, and it's very tasty dessert every day, with only what you have in your kitchen.